U.S. Ends Laptop Ban On Flights From Middle East : The Two-Way The ban originally affected 10 airports and nine airlines, mostly Middle Eastern carriers. Meanwhile, the U.S. has issued additional security requirements affecting some 280 international airports. 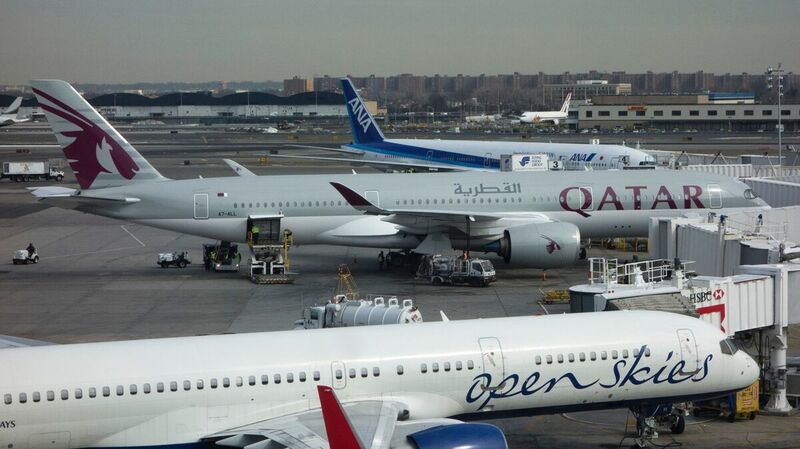 The U.S. announced Wednesday that it had lifted the laptop ban that originally affected nine airlines, including Qatar Airways. The United States has ended the ban on large electronics in the cabins of airlines that it announced in March. King Khalid International Airport in Riyadh, Saudi Arabia, was the last airport to be taken off the Department of Homeland Security's ban list, which originally affected 10 airports and nine airlines, mostly Middle Eastern carriers. DHS spokesman David Lapan tweeted Wednesday evening that the restrictions on large electronics had been lifted. "With enhanced security measures in place, all restrictions on large PEDs announced in March for 10 airports/9 airlines have been lifted," he wrote. The DHS had banned electronic devices larger than a smartphone in the cabins of airplanes on direct flights to the U.S. from 10 airports in the Middle East and North Africa. The ban affected airports in eight countries: Saudi Arabia, Qatar, Kuwait, United Arab Emirates, Turkey, Jordan, Egypt and Morocco. These countries did not overlap with those included in President Trump's travel ban. As NPR's Greg Myre explained in March, the countries on the laptop ban list were generally stable nations allied with the U.S. Unlike the more troubled countries on the travel ban list, "you think of these countries on the airline list, and you're talking about a wealthy businessman, jet-setting around the world." Security experts have said the threat of explosives hidden in a laptop is real, as NPR's David Schaper reported last month. But with laptop restrictions now lifted, DHS seems to believe the enhanced security measures implemented at the 10 airports are sufficient. Meanwhile, the U.S. has issued a new directive to airlines on additional security measures they must take, including increased security and screening protocols, affecting direct flights to the U.S. from about 280 airports around the world. Lapan, the DHS spokesman, tweeted Thursday that "all 180 airlines" have implemented the first phase of the security measures. "They're particularly worried about laptops and anything really larger than your cell phone or smartphone. And there will be more thorough passenger vetting," David told NPR's All Things Considered in separate report late last month. "There will be new measures to head off any threats from insider attacks. That means people who work at the airport or work for the airlines. They're going to require the airlines to acquire some more sophisticated screening equipment, better technology and even use better explosive-detecting dogs better to try to determine if there are bombs being smuggled on to flights and if there is a legitimate threat there," David reported. Airlines that don't make the changes could get hit with an in-cabin electronics ban. The new regulations affect international airports including those in Mexico and Canada and could involve requiring passengers to prove their larger electronic devices can be powered on, according to The Associated Press. Wednesday was the deadline for some of the changes to be implemented. The new procedures could lengthen security screenings. Mexico's aviation authority has instructed U.S.-bound passengers to arrive at its airports three hours early, the AP reports.